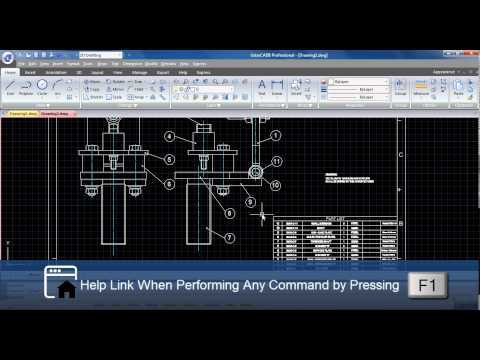 What’s new GstarCAD 8 | AppliCAD Indonesia. Ensures more .dwg and APIs compatibility, more fluid data exchange and big room for further improvement and development. Like smart graphic partition, self-adaptive data model and memory storage management boost from 3 to 5 times user design experience, handling lees graphic data and memory occupancy specially on complex tasks or huge drawings. Great compatibility of GRXI/GRX in APIs and enhancement on LISP rewrite performance from 5-10 times. where bugs and errors are easier to fix than before. thus there is a substantial improvement on quick technical support service for users feedbacks. GstarCAD8 adopts Unicode to write and compile programming and is able to open drawings which contain multi-language texts or without the system default language, in order to satisfy across-languages, text conversion and processing requirements. GstarCAD 8 offers a Non-restart switching UI what is easier for users to switch between different ribbon/classic interface instead to restart the program. GstarCAD 8 provides a convenient way of changing views, visual styles, viewports and other settings. In GstarCAD8, you can invoke the most compatible commands in your favorite way: from menu, ribbon, toolbars, command line. Additionally, there are more comprehensive options within dialog boxes which are highly requested by users who are getting used to the operation of AutoCAD. GstarCAD 8 supports to set different VP color, VP linetype, VP linewidth for viewports at layout space that makes layout settings be super flexible. Not only the setting speed of layer manager is faster, but also the speed to lock/unlock layers is enhanced. GstarCAD 8 covers more format industries than previous version. Export (*.dwfx, *.stl, *.eps, *.dxx), imports (*.sat, *.3ds, *.wmf) and publish PDF and 3D DWF as well. GstarCAD8 helps to magnify the visibility of complex details without zoom in at specific area into your drawing.